Around 1900, many people in Michigan and across the United States began to understand that forest resources were not going to last forever. 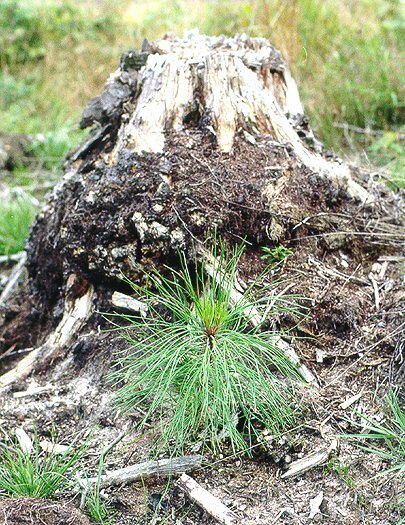 A shortage of wood and the loss of other forest values was seen as a possibility. During the Conservation Period, many groups and agencies were formed. The U.S. Forest Service was organized in 1905 and our National Forests were created between 1909 and 1938. The Michigan Forestry Commission was established in 1899 and the Michigan Department of Conservation (now the Department of Natural Resources) was formed in 1921. The first State Tree Nursery was established at Higgins Lake in 1904. The first corporation to hire a forester was Cleveland Cliffs, who hired S.M. Higgins in 1903. The Conservation Era lasted about 40 years roughly from 1900 to 1940. Nationally, there were many leaders driving the conservation movement. Gifford Pinchot and John Muir were two of these leaders. Pinchot wanted the federal government to get involved with forest management. He was interested in making sure there was enough wood and other forest uses for the generations of Americans to come. Pinchot realized that we needed to manage forests for the benefit of society. He began the Society of American Foresters, which celebrated its 100th birthday in 2000. Muir wanted to keep special places from from being changed by people. He was an important person in making Yosemite National Park the first national park in the world. Both men were friends of Teddy Roosevelt, our 26th president. Roosevelt pushed for a lot of new conservation laws. In the 1920s and 1930s, many landowners didn't have enough money to pay their property taxes. So, much of the land was abandoned and returned to the government. The government decided to form State and National Forests. National Parks and Wildlife Refuges also began during this time. 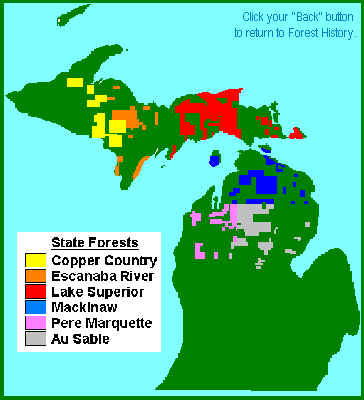 Some Michigan counties resisted forestry and the creation of public forests. 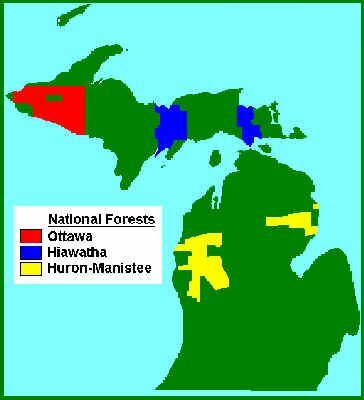 Michigan now has six State Forests and three National Forests, each with its own history. Michigan has the second largest State Forest system in the United States, about four million acres or about a fifth of the Michigan forest today. The National Forests hold about 2.6 million acres. During the 1930s, the economy of the United States was doing very poorly. Many people didn't have jobs and couldn't afford decent housing or enough food for their families. To help give people jobs and to help forests recover, the federal government started the Civilian Conservation Corps. These CCCers worked on the new National and State Forest lands. They built and improved many National and State Parks. In 1933, the Michigan CCC was organized. Crews planted almost half a billion trees, fought hundreds of fires, built 7000 miles of roads, improved streams, stocked lakes with over 150 million fish, built 222 buildings, surveyed groundwater, conducted wildlife projects, and made the Seney Wildlife Refuge. They put out a giant fire on Isle Royale in 1936. Michigan had over 50 camps with thousands of workers. Michigan also started forestry schools in the beginning of the 1900s, including the Forestry Departments at the Michigan State University, University of Michigan, and Michigan Technological University and the Wyman School of the Woods. In the early 1900s, foresters learned a lot about the forests, wildlife, and the land. Through research and experience, we have developed current forest management practices.